Larry Tremblay is a writer, director, actor and kathakali specialist. Translated into a dozen languages, his acclaimed theatrical works have been produced in many countries. He has published a collection of stories, Piercing (2006), and his novel The Bicycle Eater (2002) was a finalist for the Governor General’s Literary Award. His plays, The Dragonfly of Chicoutimi, The Ventriloquist, Abraham Lincoln Goes to the Theatre, and The Ax, are considered classics. 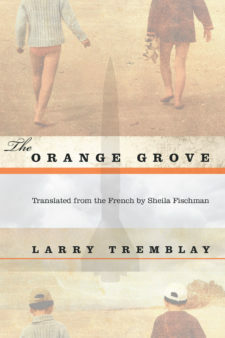 Tremblay’s novel The Obese Christ (2012), was a finalist for the Prix littéraire des collégiens and The Orange Grove won the 2015 Prix des libraires du Québec in its original French.